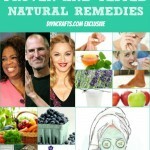 Feel free to submit your favorite natural remedies via contact form or let us know in comments. We’ve worked hard to compile this collection so any feedback is appreciated, we’ve used only trusted sources. Lovely isn’t it? :) I think refashioning, slimming and transforming jeans are the easiest thing ever! Enjoy our top 70 DIY projects selected from the best diy bloggers! 20 spots left open for user submissions! 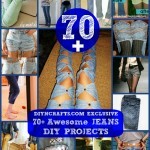 :) Feel free to comment and let us know your favorite Jeans DIY.